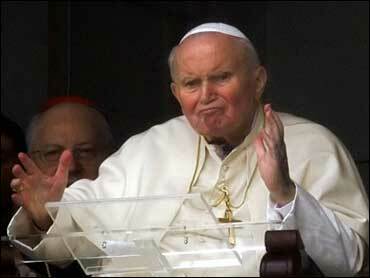 Pope John Paul II will leave the hospital Sunday evening, the Vatican announced after the pontiff greeted pilgrims in a raspy voice in his first live address to the faithful since undergoing throat surgery last month. The 84-year-old pope's voice was hoarse and he spoke just a few words at midday Sunday, waving and making the sign of the cross with a steady hand to the faithful gathered beneath his 10th-floor suite at Rome's Gemelli Polyclinic hospital. "Dear brothers and sisters, thank you for your visit," he said, reading from a sheet of paper. "To everyone, have a good Sunday and a good week." It was the first time since his Feb. 24 operation to insert a breathing tube in his windpipe that John Paul addressed the faithful in remarks carried live. In three previous appearances, the pope had remained silent. The Vatican's brief statement made clear that the pope was not cured, but was well enough to continue his recovery back at St. Peter's. The Holy See had said last week that John Paul would be released in time for Holy Week celebrations, which begin on March 20 with Palm Sunday and culminate a week later with Easter. The Holy See did not say whether the breathing tube had been removed, and it did not confirm Italian media reports that John Paul would take a limousine rather than his glass-paneled popemobile back to Vatican City. "The Holy Father, in agreement with the attending physicians, will return to the Vatican this evening, where he will continue his convalescence," the Vatican said in a statement. Roman Catholic pilgrims reacted with delight to the announcement. "The pope is putting everything back together," said Silvia Toscano, 28, of Sicily, standing vigil outside the hospital. "The Lord helps him, and perhaps it also helps him to know that there are so many people who wish him really well, who love him." The pope's speaking difficulties are complicated by Parkinson's disease, raising concerns over John Paul's ability to communicate to the faithful and guide the world's 1 billion Roman Catholics. Archbishop Leonardo Sandri of Argentina, the pope's public voice since his latest health crisis, read the weekly Angelus prayer and blessed a spirited crowd of faithful across town at St. Peter's Square on Sunday. In remarks read by Sandri, the pope expressed his gratitude to journalists who "not without sacrifice" are carrying out their work, "thanks to which the faithful in every part if the world can feel closer to me and accompany me with affection and prayer." "The role of the mass media in our era of global communications is very important," the pope's message said. "The responsibility of those working in their field, called to furnish timely information respectful of a person's dignity and attentive of the common good, is also great." John Paul also said he hoped to see many young people taking part in a Palm Sunday celebration at St. Peter's Square, which he said "leads us toward" the Roman Catholic Church's World Youth Day in Cologne, Germany, in August. The pope greeted pilgrims from his hometown of Wadowice, Poland, who sang and prayed beneath his room, waving Polish flags and bouquets of flowers and carrying a gift basket filled with Polish delicacies such as lamb and ginger cakes. "It is enough for us that the Holy Father is coming quickly back to health, and we have the hope that our prayers and our presence here were the cause of this," said Eva Filipiak, the mayor of Wadowice. "We hope that we have helped him to carry his cross." Hundreds of people cheered and applauded as they gazed up at the pope's hospital window. Some used binoculars to see him better and snapped pictures with their cell phone cameras. "It's something inside that you cannot express with words," said Pina Mariani, 54, wiping tears from her eyes. Alizja Bakalik, pushing a stroller with her 9-month-old son, Karol, named after the pope, held a sign that read: "Best wishes to Karol from little Karol." The fact that the pope spoke "is very beautiful," she said. "I really didn't expect it. It shows that he is getting better and that our prayers are helping him."